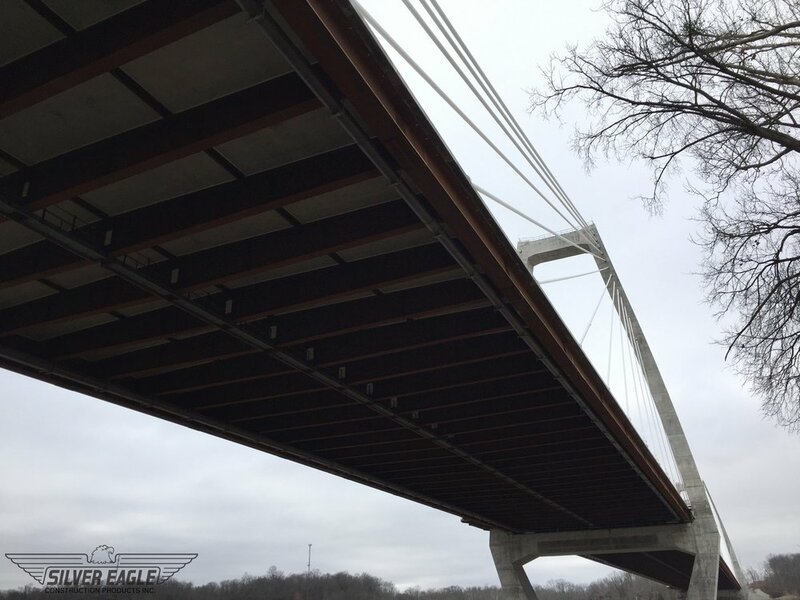 OHIO RIVER BRIDGES — Silver Eagle Construction Products, Inc.
Silver Eagle Construction Products, Inc. is a miscellaneous steel fabricator and material supplier for the heavy highway, road, and bridge construction industry throughout the Midwest. We take great pride in providing exceptional customer service while supporting our customers’ projects with the best quality products available. 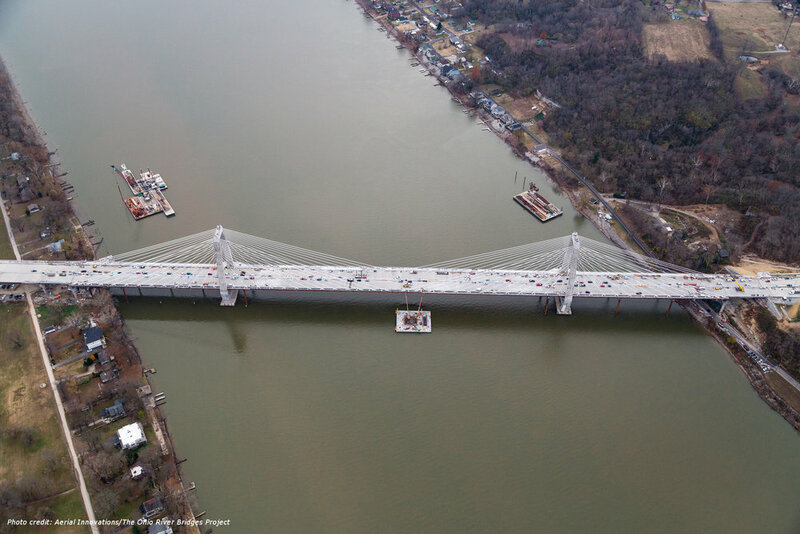 Silver Eagle Construction Products, Inc. designed, fabricated, and delivered the fiberglass bridge drainage systems for several portions of the Ohio River Bridges project in Louisville & Southern Indiana. The $2.6 billion project was a joint effort between the states of Indiana and Kentucky. The drainage systems varied from 6" in diameter to 27" in diameter and were installed on highway overpasses and all three of the major river crossing bridges. 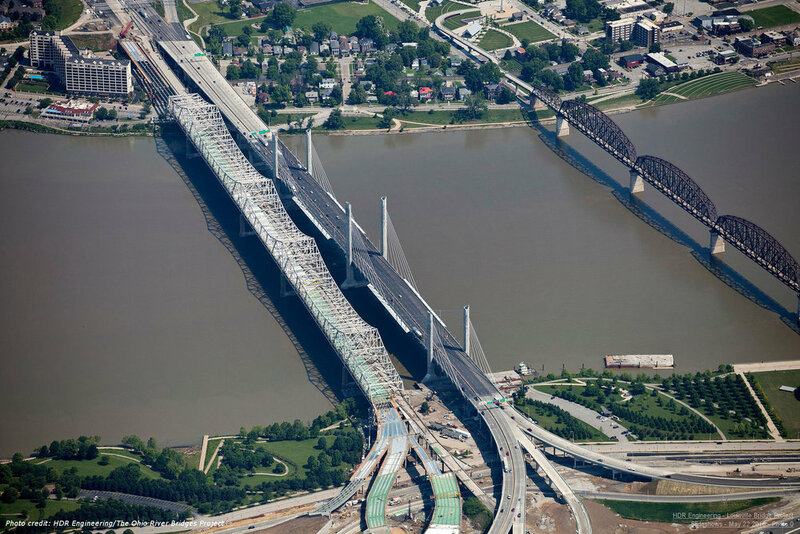 Section 1 of the project included the Spaghetti Junction in downtown Louisville, which was a complete redesign and construction of 35+ highway overpasses rerouting the interstate highways through the area and onto new approaches to two downtown river crossings. 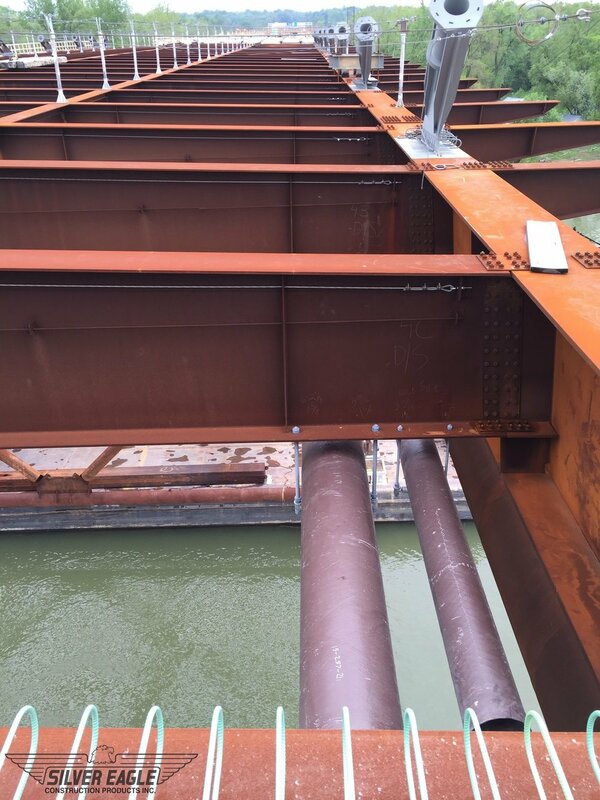 The drainage system for Section 1 included more than 6,000 LF of 6" diameter fiberglass bridge drain pipe and was custom-pigmented to match the finished color of the concrete. Each bridge was tagged with the corresponding bridge numbers and shipped directly to the site or to the contractor's lay down yard along the river. Section 2 of the project included a major rehab of the existing Kennedy Bridge and the construction of the all-new Abraham Lincoln Bridge, a 2,100 foot long cable-stayed bridge. The drainage system for both the Kennedy Bridge and the Lincoln Bridge required 3,400 LF of fiberglass pipe and approximately 500 fittings. 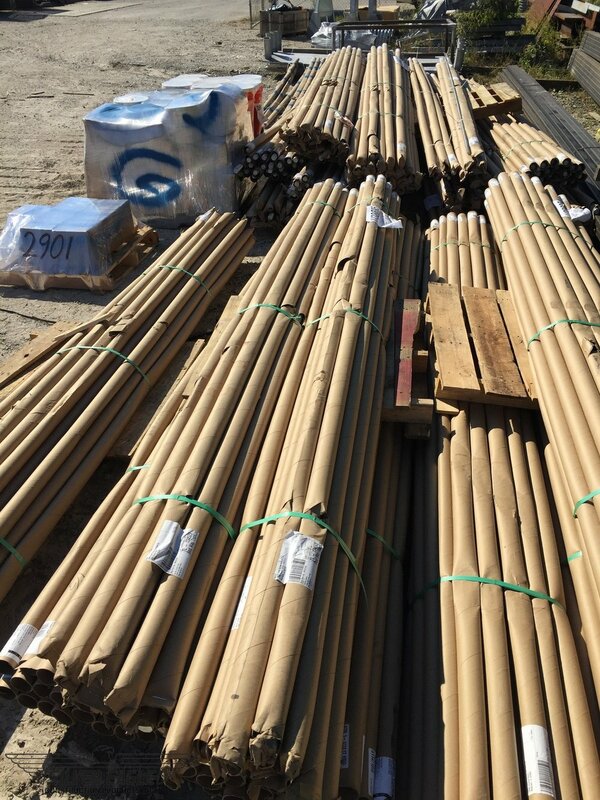 Midway through construction, the design of the drainage system was modified to include not only 6", 8", and 10" pipe, but also added over 600 LF of 12" pipe. This pipe was also custom-pigmented to match the finished color of the concrete. Sections 4 and 5 of the project included construction of the Lewis and Clark Bridge, a tunnel, and completion of I-265, resulting in a continuous ring road around the Louisville metro area. The Lewis and Clark Bridge is a 4,500 LF (river span + approach bridge) long cable-stayed bridge and has over 15,000 LF of fiberglass bridge drain pipe on it. The drainage system was designed to collect water from the bridge deck and transport it to retention ponds in Kentucky, therefore protecting the wellhead adjacent to the bridge. 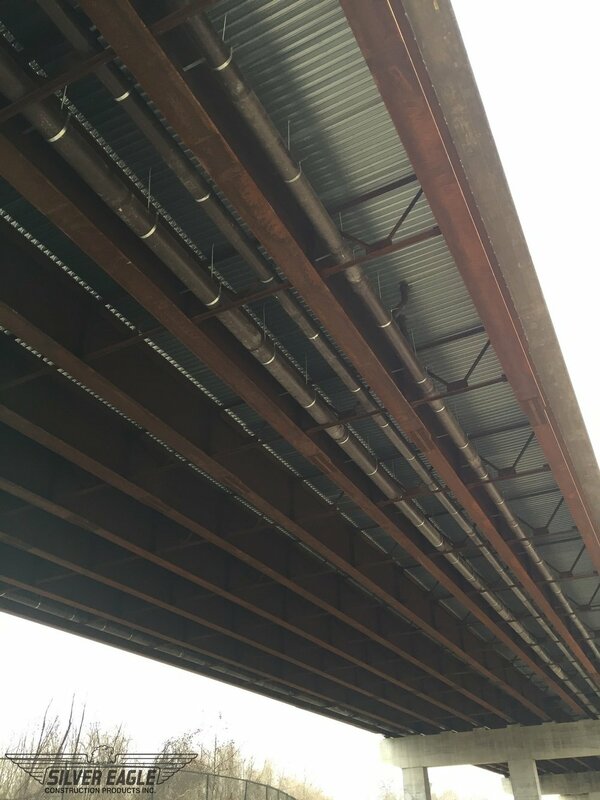 The design of the system includes custom fiberglass scuppers installed in the bridge deck with 8" diameter fiberglass downspouts connecting to various sizes of fiberglass collector pipes. The collector pipes are arrayed in four parallel lines that travel the length of the bridge increasing from 12" diameter to 27" diameter. All of the fiberglass was custom-pigmented to match the weathering steel girders. 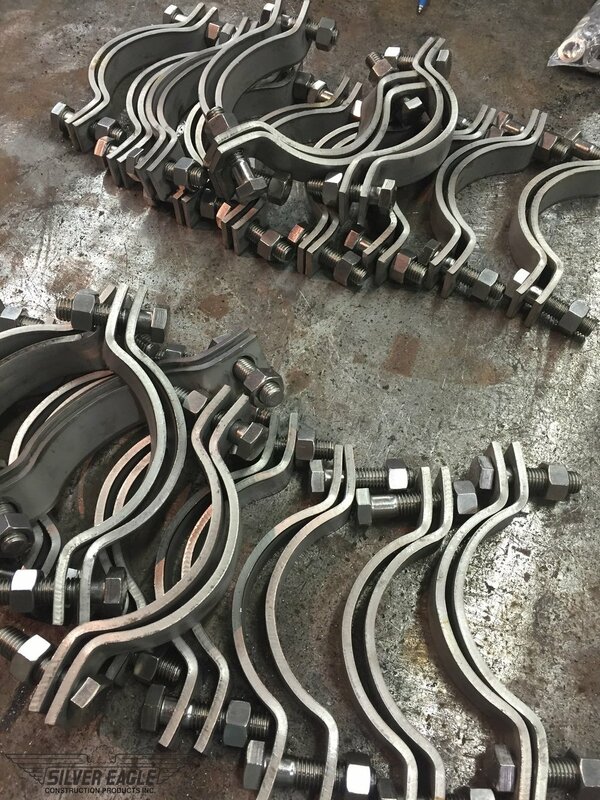 Silver Eagle Construction Products, Inc. fabricated custom hangers and support angles to accommodate multiple offsets in the pipe runs required to maintain certain alignments within the system. Greater than 500 custom 1-1/2" diameter galvanized and stainless steel ferrule loop inserts were specifically manufactured for this project, as were over 1,000 custom fiberglass fittings - including several fiberglass expansion joint fittings designed for 32" of movement. More information can be found on the project's websites. Additional project photos can be found on Flickr. Copyright 1981-2019 by Silver Eagle Construction Products, Inc.